Tourism is a vital economic activity, and a significant contributor to employment and GDP for most of the predominantly small island developing states (SIDS) of the Caribbean, which is widely regarded as the most tourism-dependent region in the world. In terms of economic share of market, the Caribbean tourism landscape is dominated by large all-inclusive chains, a reality that contributes to some of the challenges faced by the sector, such as high leakage rates (%ge of tourism revenue that does not pass through the domestic economy), and the marginalization of smaller players, including small hotels, guest houses, attractions and craft vendors. However, there seems to be the growing emergence of a new type of tourist and tourism market that thrives on visitor-community interaction, exploration and exchange. Community-based tourism offers a promising response to this market shift, and seeks to empower local communities as sustainable ecosystems. It is a key component of Jamaica’s Tourism master plan and current efforts to diversify the Tourism product. The project "Empowering Local Communities with Open Data and Interactive Community Mapping" is one of several strategic open data initiatives currently being implemented by the Caribbean Open Institute that explores the potential of citizen-generated open data using Interactive Community Mapping (ICM) as a platform for enhanced community tourism products and services. ICM has been used in various contexts to support activities such as disaster preparedness & response, community asset profiling, and facilities planning & management. However many ICM initiatives tend to be one-off projects implemented through external facilitation, that struggle to develop the intrinsic characteristics necessary to become self-sustaining. In conceptualizing our ICM project to become both sustainable and repeatable, Firstly, we knew that a systematic approach to training and capacity building was one of the key enablers. We were fortunate to identify and work with a very enthusiastic and engaged training facilitator Milo van der Linden, from the Netherlands. 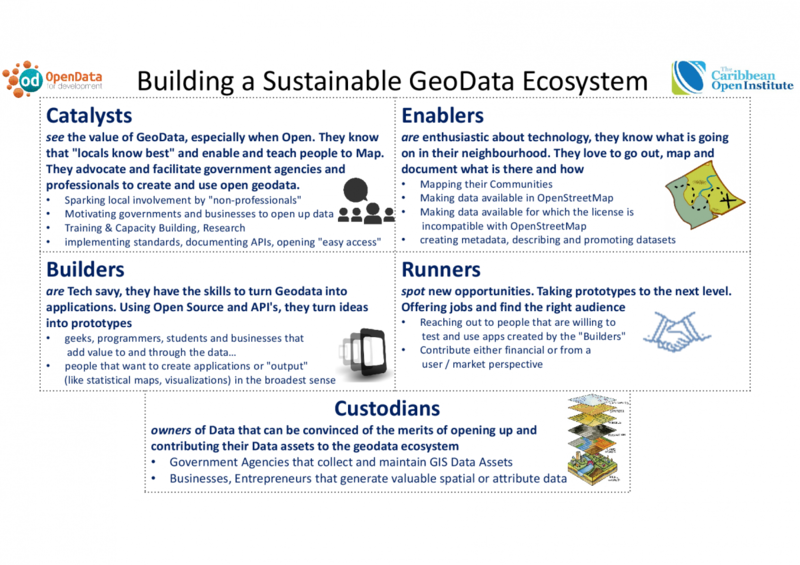 Milo helped us to define the essential pieces of a vibrant Open geoData ecosystem that would sustain our ICM initiative. Secondly, we selected the August Town community in Kingston, Jamaica for our pilot project. August Town is adjacent to the Mona campus of the University of the West Indies and is part of the University Township outreach project. August town has experienced periods of inner-city violence in the past, but is well known for it’s rich heritage and cultural history, including being the historical base for Alexander Bedward founder of Bedwardism, one of Jamaica’s prominent Revivalist movements in the early 1900’s. Iconic reggae artistes Sizzla and Etana have their creative bases in August Town, while the recent August Town film project of the University has created the rapidly growing GATFFEST film festival. Thirdly we needed to find our Enablers: individuals who are enthusiastic about technology, know what is going on in their neighbourhood, and willing to go out, map and document what is there and how. Working through key community partnerships, we identified ten (10) young persons from various sub-communities in August Town to become the 1st cohort of trained community mappers. The mappers participated in an intensive 5-day workshop June 13th – 17th where they were exposed to the essentials of geoData for modelling real-world geographical artifacts, the OpenStreetmaps platform, and practical field mapping and editing techniques. On completing the workshop, the mappers organized into teams of 2 persons and were assigned designated grid areas to map the entire August Town community over a 4-week period. The mapping field work included identifying points of interest, tour routes, and capturing associated multi-media content in pictures and video. The teams took to their tasks with great enthusiasm and energy, and in the short period of time since their workshop and field mapping training, the AT Mappers (as they have now branded themselves) have digitized over 9,000 features (including 4 bus-stops, 85 addresses, 1000 buildings, 250km of roads, 250 photos and videos). They also entered a hackathon (DevCA) where they applied their unique mapping skills and community knowledge to the #hackZika challenge, and placed 3rd. They have created their own interactive social media presence (twitter: #ICM_jamaica and fb: @ICMja) and a vibrant and active whatsapp channel for interactive communications. The August Town digital map assets are being used as a platform for developing a virtual August Town tour that will be a feature of the upcoming 178th anniversary celebration of the community. The AT mappers are now engaged in discussions with a local government agency to provide mapping support to various community initiatives that promote school safety, support community resilience and response to the Zika virus threat, and map tourism assets to enhance the visibility for some of Jamaica’s eclectic tourism destinations. As much as it is about building digital artifacts that model the community and its offerings, interactive community mapping is also about building human capacity. Sustainable capacity-building goes beyond developing the skills to create digital map assets; it includes the empowerment and self-belief about the creative combination of technical skills and knowledge of their community that gives our community mappers a unique capability that can be re-purposed in so many ways. We continue to see this pilot project evolve and adapt as new circumstances and opportunities arise, and hope it can be propagated to other communities across Jamaica. We look forward to the AT Mappers becoming pioneers and catalysts for continuous knowledge exchange, training and building a vibrant interactive community mapping culture as part of the emerging open data ecosystem across the Caribbean region.